After wanting to know how much it costs to install an in-ground liner pool, the second question everybody has is “how long does it take?” There are four major steps (and many small steps in between) in the pool installation process that takes between two and three weeks to complete – depending on the type of pool and options selected. 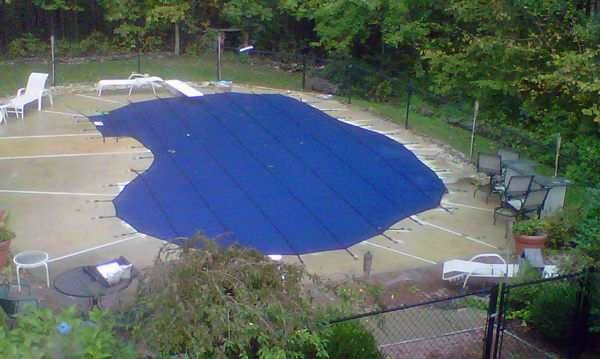 At Daigle Servicing Company, we have in-ground pool installation down to a science. With a very thorough planning process, our clients know exactly what to expect and how much it will cost before the contract is signed. 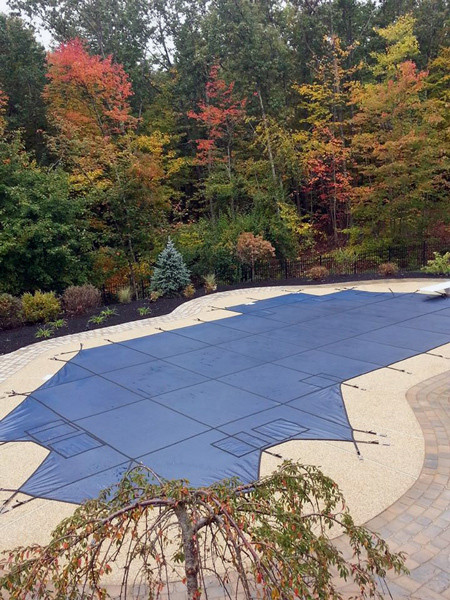 With our own in-house construction team, the build process of our in-ground liner pools runs very smoothly from start to finish with a consistent level of quality on every job we do. Client meets with the owner, Don Daigle, to design their pool. During the planning process, pool styles, options and budgets are discussed. Don reviews the contract – what is covered and what is not – and explains the process. Once a contract has been signed and first deposit received, layout and site preparation begins. Underground utilities are notified (DIG SAFE) and a building permit is pulled. Daigle Servicing Company can assist with permitting if necessary. After the pool shape and elevations have been set, excavation equipment is brought in to begin digging the pool. Normally this step only takes a day. Sometimes however, the site conditions can cause delays or additional work. There could be ledge that needs to be hammered out or blasted; high water table may require bringing in drainage stone to correct the problem before construction begins. Daigle Servicing contractors will always notify the client before proceeding in any work that is beyond the scope of the contract. Once the hole has been dug, we are ready to begin assembling the pool. After the steel walls are bolted together and leveled, PVC plumbing lines are placed, and ready mix concrete is brought in to form a sturdy foundation base for the steel walls. With the walls securely in place, we shape the bottom of the deep end with a vermiculite and Portland cement mixture. 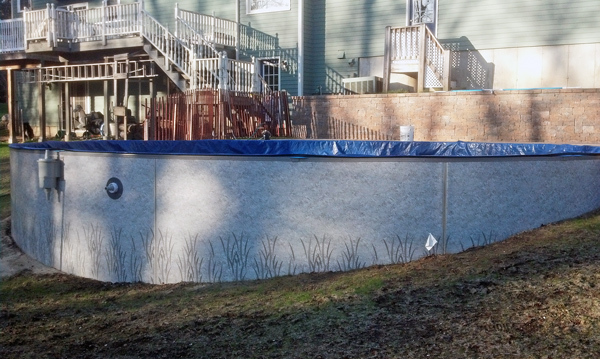 Quarter inch foam covers the walls and shallow end floor of the pool before the liner is installed. The final step in the pool construction phase is installing and hooking up the equipment. A licensed electrician brings the power out to the pool filter and heater. The pool is then filled either using a garden hose from the house, or we can provide a pool water delivery if the homes water source is not able to fill the volume of the pool. After testing the pool equipment, the pool is backfilled with gravel and pool deck is poured. 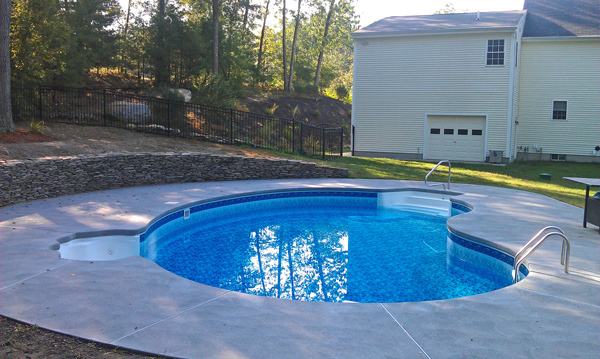 We offer three options for a pool deck finish – brushed, stamped, or exposed aggregate. The fencing is now ready to be installed around the pool. Only one more step before our client can now swim in their new pool: they have to go to “Pool School!” Don Daigle, owner of Daigle servicing company will instruct the client about their new pool equipment, and how to keep their water sparkling clean. Remember: we don’t just install a pool and disappear. 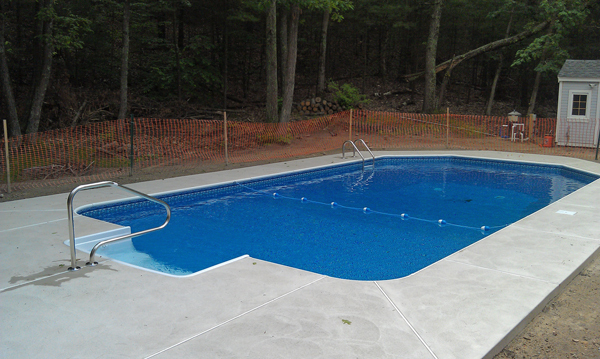 Daigle Servicing Company is always available to help our clients after their new pool is installed. Most of our clients trust our recommendations year after year. Our greatest satisfaction is in knowing that our clients are truly enjoying their pool.